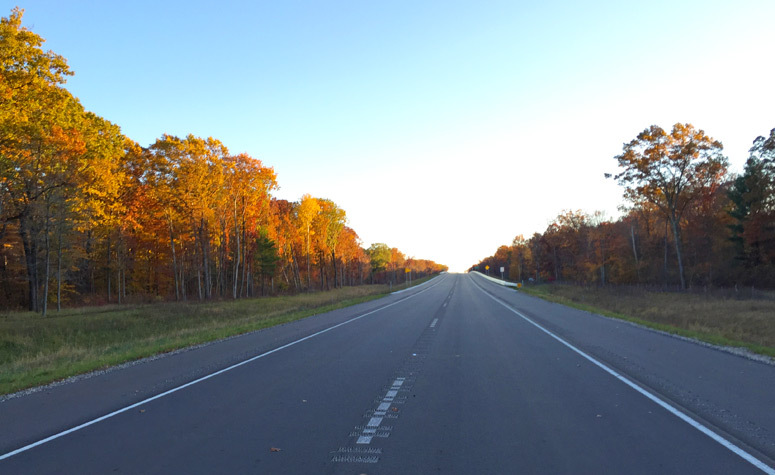 On Sunday, October 25, 2015, the Michigan Highways webmaster and author toured the still yet-to-be-opened to traffic M-231 route in north central Ottawa Co. The highway itself was almost 100% complete, with just a few minor odds-and-ends remaining to be wrapped up. These pages include photos taken on that bicycle trip. Also see a time-lapse video taken from the handlebars of the bicycle during that trip: M-231 Bike Trip Time-Lapse Video. 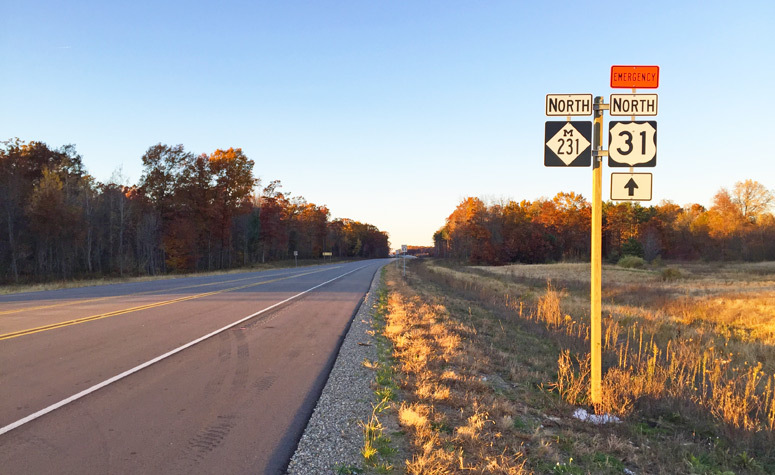 While the original (and, possibly, still ultimate) plans for M-231 were (are) to be one phase in an overall project to construct a north-south US-31 freeway between the Holland and Muskegon areas, there are very few obvious signs of this to the casual observer. However, at this stream crossing between Johnson St and Lincoln St in Robinson Twp, MDOT had two box culverts constructed, not just one. 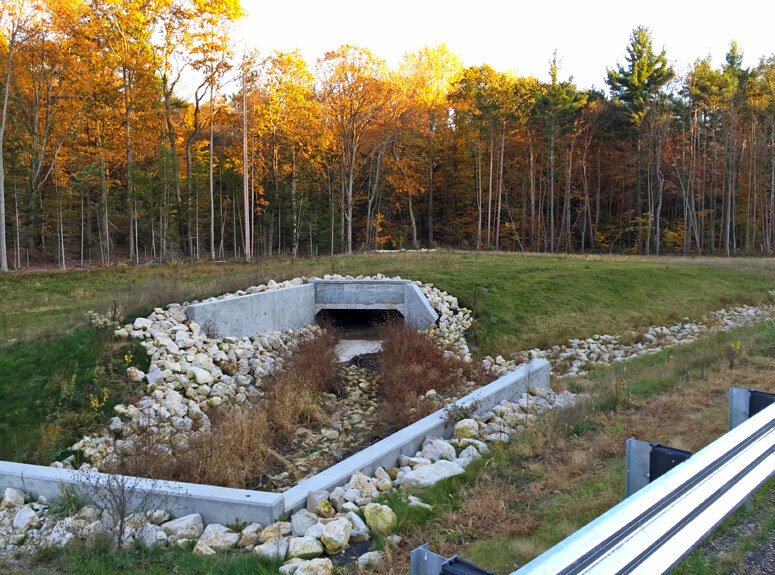 The existing M-231 highway travels over the western culvert, while the grass-covered eastern culvert would be used should the route be converted to a four-lane freeway in the future. ©2015 Christopher J. Bessert, All Rights Reserved. Looking southerly along M-231 between the North Cedar Dr and Sleeper St overpasses in Robinson Township on October 25, 2015 prior to the highway's opening five days later. ©2015 Christopher J. Bessert, All Rights Reserved. 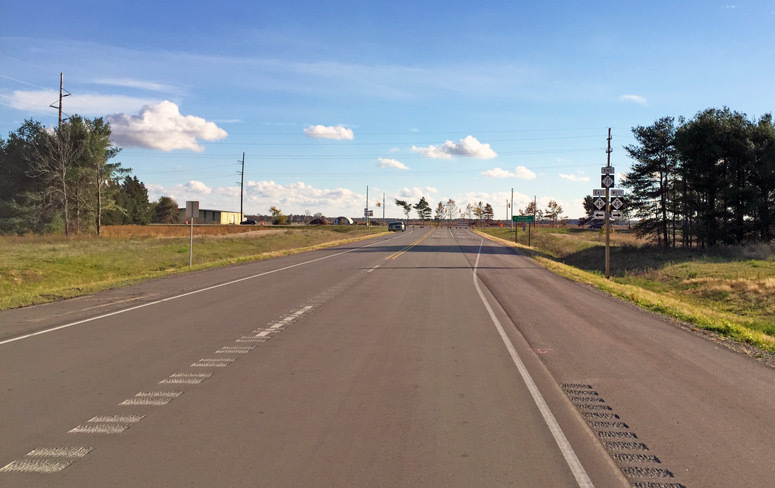 Looking northerly along M-231 from the Stearns Creek overpass between Lincoln St and Sleeper St in Robinson Township on October 25, 2015 prior to the highway's opening five days later. ©2015 Christopher J. Bessert, All Rights Reserved. Aside from the many bicyclists, smattering of pedestrians, assortment of in-line skaters, and even a few rogue automobiles utilizing the not-yet-open-to-traffic highway (ahem, you motorists! 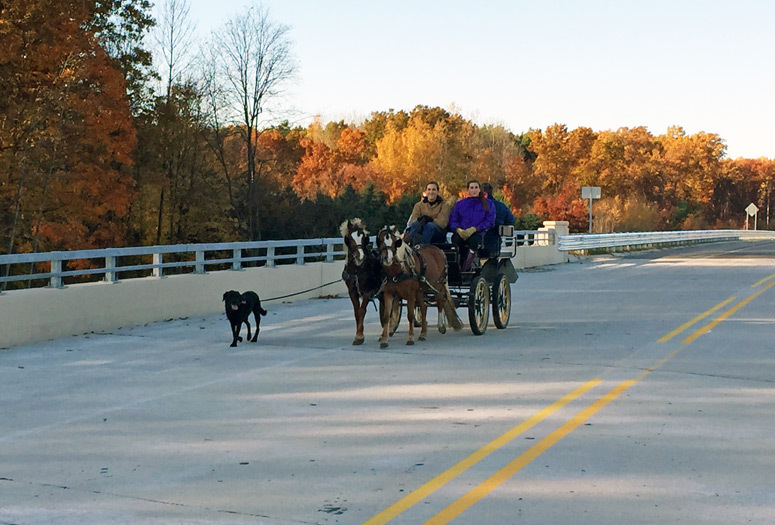 ), this group of people decided to see the new highway in a rather unique way—in a small carriage hitched to a pair of miniature horses! ©2015 Christopher J. Bessert, All Rights Reserved. The view looking northerly along M-231 from just north of Lincoln St with the northbound M-231route marker reassurance assembly. ©2015 Christopher J. Bessert, All Rights Reserved. 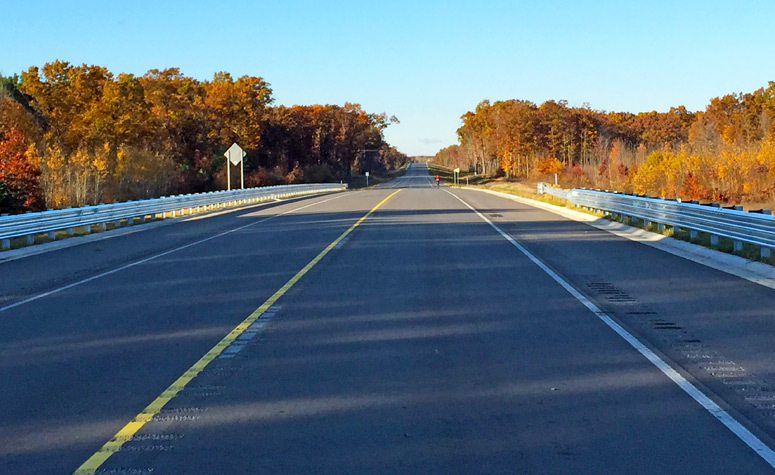 Approaching the southern terminus of M-231 at M-45/Lake Michigan Dr. Taken during a bicycle tour of the yet-unopened M-231 route on October 25, 2015. ©2015 Christopher J. Bessert, All Rights Reserved. ©2015 Christopher J. Bessert, All Rights Reserved. 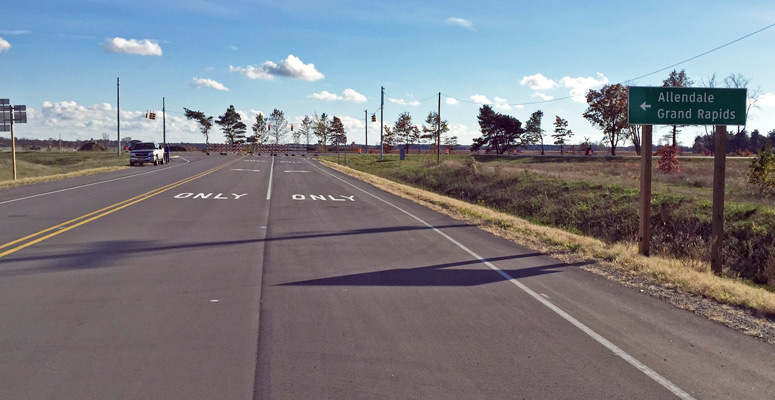 A closer view of the southern terminus of M-231 at M-45/Lake Michigan Dr. Taken during a bicycle tour of the yet-unopened M-231 route on October 25, 2015. ©2015 Christopher J. Bessert, All Rights Reserved. The first northbound M-231 (and EMERGENCY NORTH US-31) route marker assembly north of M-45/Lake Michigan Dr. ©2015 Christopher J. Bessert, All Rights Reserved. 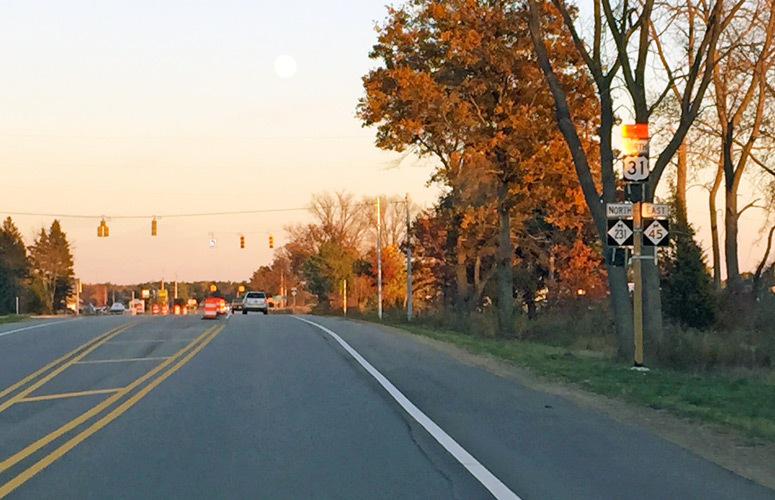 A view looking westerly along M-45/Lake Michigan Dr at the unopened M-231 intersection on October 25, 2015. 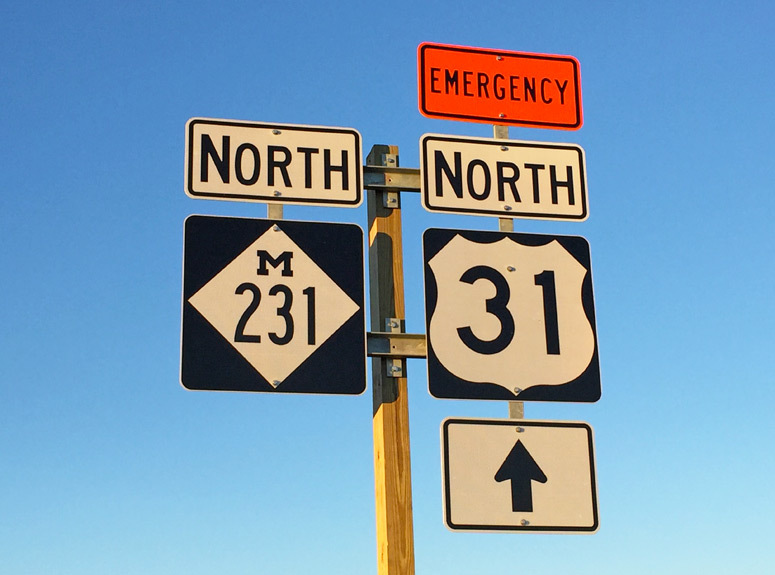 This view shows the partially obscured route markers for M-231 and EMERGENCY NORTH US-31, as well as the missing through arrow on the M-45 route marker assembly. ©2015 Christopher J. Bessert, All Rights Reserved.